Saturday March 1st 1884 I worked about the house all the forenoon and noon so I ate my dinner went over to Hatts to help her sew her carpet we got a little start on it. I came home just at supper time nearly sick. I went to bed early. Sunday March 2nd 1884 It was the worst day of the winter a regular blizzard from the north west. We were all at home. Monday March 3rd 1884 Weather still cold though not so bad as yesterday. I helped do the work and feel a little better than I have for a few days. 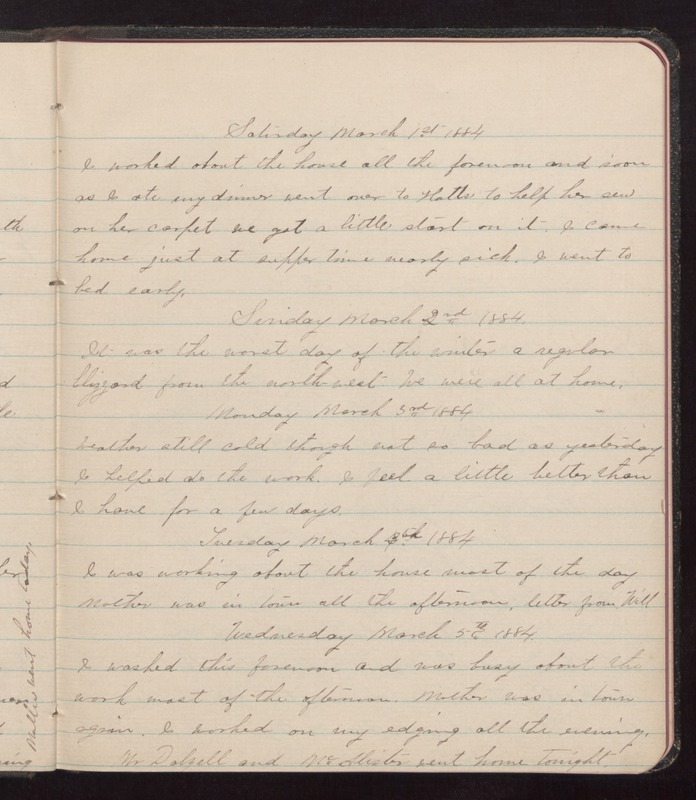 Tuesday March 4th 1884 I was working about the house most of the day. Mother was in town all the afternoon, letter from Will. Wednesday March 5th 1884 I washed this forenoon and was busy about the work most of the afternoon. Mother was in town again. I worked on my edging all the evening. Mr Dalzell and Mrs Alister went home tonight.